3/4 c gorgonzola picante (look for a stronger, firmer gorgonzola, instead of the very soft gorgonzola dolce), chopped into medium size hunks. Chop the pear into small cubes and place into acidulated water (water that has a few drops of vinegar or lemon juice in it). Finely chop the onion and set aside. Same with the pancetta. Put the salted pasta water on to boil. When the water is just about ready, using a saucepan that is big enough to hold the ravioli, melt the butter and add the onion. You want to soften the onions, not brown them. Using a whisk, slowly add the cream and allow it to heat up. Drain the pear cubes and pat dry. In another pan, sauté the pancetta/lardon/bacon. My pancetta is very lean so I need to add a few drops of olive oil to keep the pan from scorching. When the cream/onion mixture is warm and almost at the boil point, add the gorgonzola and start to gently whisk it around. You want the gorgonzola to melt, but be careful not to let it boil too much. Add your ravioli to the boiling water. If its fresh ravioli, your cooking time is only about 2 minutes, or until the water returns to a boil and everyone is happily floating and dancing in the boiling water. Add the pears to the pancetta and stir them to brown evenly. Drain the ravioli and place them in the gorgonzola sauce to thoroughly coat. After about 30 seconds, remove and plate the ravioli. 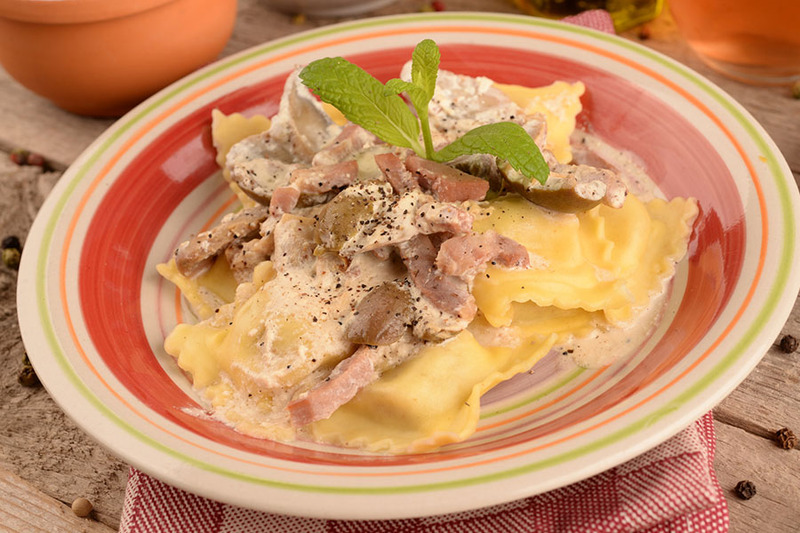 Using a fork or slotted spoon, remove the pancetta and pear bits and scatter on top of the ravioli. Serve immediately. It looks like too much sauce, but we licked our plates clean. If you think it’s too ‘saucy’ cut back a bit on the cream. But, don’t say I didn’t warn you.